Barbara Calzolari, Pope Benedict XVI’s calligrapher will arrive to the 2nd International Exhibition of Calligraphy opening ceremony at the behest of Alexey Shaburov, Director of the Contemporary Museum of Calligraphy. Barbara Calzolari is a renowned person of the Italian fashion-industry. She is the designer of Pirelli, Ferrari and Ferrero. Barbara works with Massimo Osti from the StoneIsland and C.P. Company, Danielle di Montezemolo, Ferrante Gonzaga and other guru of the fashion world. She regularly attends international calligraphy conventions, where she has met and worked alongside Pat Blair, current calligrapher for the White House. 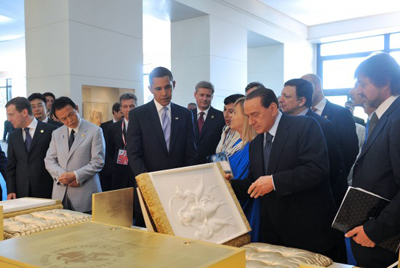 In 2009 Barbara was called to make a special gift for the G8 summit. She was writing and illuminating the national anthems of the countries represented at G8. Their national anthems made by Mrs. Calzolari were given to the President of the Russian Federation Dmitry Medvedev, President of USA Barack Obama, President of France Nicolas Sarkozy, Chancellor of Germany Angela Merkel, Great Britain’s Prime Minister Gordon Brown, President of the European Commission Jose Manuel Barroso and many others. Besides, Barbara is a member of the world-know calligraphy associations. At the time she is finishing her book about Catherine de’Medici. Moscow will have Barbara Calzolari for quite a long time: from October 12th to 18th. She is going to participate at the opening ceremony of the 2nd International exhibition of calligraphy (October 14th), show her masterpieces and give live master-classes in pavilion 7a of Sokolniki exhibition centre.